Much as I love my Cornish home, sometimes opportunities arise that have to be grasped. We are leaving Liskeard and moving to Lymington. This seems an appropriate time to highlight some of the features that Liskeard has to offer and the food venues I will miss. I must have a subconscious attraction to places beginning with L. I have lived in Liskeard, Lausanne, London, Loughborough, Leamington Spa and Launceston. I will soon be living in Lymington. You’ll be hearing more about that particular town in future posts. Liskeard is an attractive town that straddles a series of interlocking hills. It has views towards Bodmin Moor to the north and on a clear day you can see the sea to the south. Many of the houses were designed by local architect Henry Rice during the Victorian boom years and account for much of the town’s charm. Unlike many town centres, Liskeard still has a number of independent shops. It has a fabulous book shop which will get pretty much any book you care to mention by next day delivery, if they don’t stock it already. It’s window displays are legendary. Stuart House is a venerable building which is now an art and heritage centre. King Charles I laid his head there on several occasions – it was still attached at the time. It has a cafe and a pretty little garden tucked around the back. Our museum, where the Tourist Information Centre is also located, is well worth a look too. You can find out about the local history there of course, but there’s also a great display on the iconic toys of old, such as James Bond’s Golden Gun and Chitty Chitty Bang Bang. The most recent display is both exciting and disturbing. It’s all about the impact of plastic on our environment and just how much of it ends up on Cornwall’s beaches. Liskeard also has a number of cafes, two very good greengrocers, two bakers, two health food shops, a butcher and even a fishmonger. Not so long ago it had an organic shop and a shop selling Cornish produce. Most of my needs were met with just a short walk from home. As I’ve already mentioned, Liskeard has a number of cafes catering for all tastes. Some good ones have gone, but others have arisen. It also has a pizzeria, Daddio’s, an excellent Indian and a not too bad Chinese. Here are the two cafes I frequent. If you follow me on Instagram, you’ll already know that I spend rather more time at Olive & Co than I should. It’s my absolute favourite cafe and if ever you’re passing Liskeard, I urge you to take a little detour and treat yourself to a cup of coffee, a slice of homemade cake or the best veggie burger ever. It’s not a vegetarian cafe, but vegetarians are well catered for. When it comes to cake, I’m just a tad fussy. It’s rare for me to find coffee and tea rooms where the cakes match up to the promise. Olive has never disappointed. The cakes and buns are interesting, well made and delicious. Their coffee is said to be the best around, but as I’m not a coffee drinker, I can’t pass judgement. I have enjoyed the odd iced coffee, which is very nice indeed, but I tend to stick to tea, chai or turmeric lattes. The teas are all loose leaf and my chai latte comes unsweetened, as requested. I’ve done a whole post on the Hub Cafe before, so I won’t say much more about it here. It’s a vegetarian cafe serving delicious and very reasonably priced homemade food. You won’t find it on the main streets in town, but it’s worth seeking out. It’s situated in the Liskerrett Community Centre, which offers a brilliant film club, theatre venue, artist studios, courses, exercise classes, rooms for hire and more. We have three local award winning cheeses. Yarg from Lynher Dairies is the one made famous by its nettle wrap. It’s recently moved to Truro, but began life in these parts; as far as I’m concerned, it’s still a local cheese. The Cornish Cheese Co. produces my favourite blue cheese ever. It’s flavoursome, but also quite mild and has a lovely crumbly texture. Cornish Gouda is also a firm favourite. It’s made by a young Dutch farmer who, with the help of a few cows, has managed to turn Cornish pasture into the best gouda in the country. The Little Bakehouse produces fantastic sourdough loaves and whilst they are made in a neighbouring town, Olive & Co stock them a couple of times a week. As regular readers will know, I make my own rye sourdough, but I don’t manage to make it every week and I shall miss being able to get my hands on some excellent real sourdough bread. On Fridays, we have a small market where local smallholders sell their produce. It’s from here I get my eggs. The eggs, including duck and goose eggs when in season, are from proper free range poultry, something that’s very hard to come by. I’ve been very lucky to have such easy access to these over the years and I will really miss them. 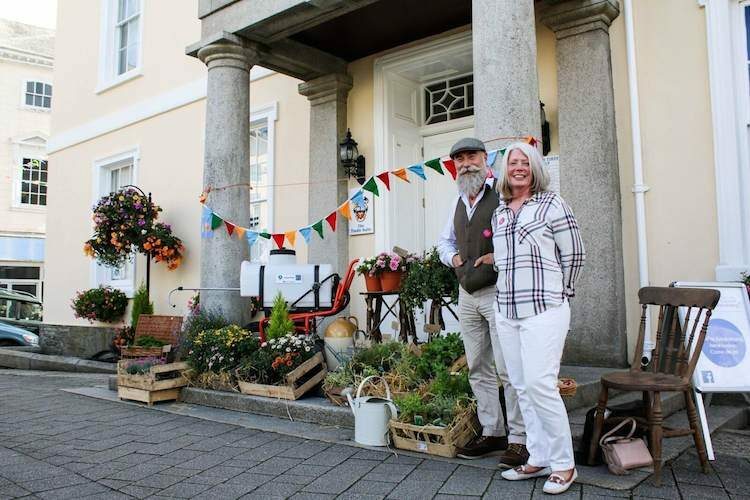 Liskeard hosts a number of events throughout the year, but the annual Ploughman’s Festival is fast becoming the most well known. Here you will find a market full of local produce in the morning, followed by music, beer and lots of scrumptious food to eat. I’ve posted about the almost forgotten Liskeard Bun before and how I got to judge its successor. I won’t repeat it here, but do take a look. Once upon a time, Liskeard was briefly made famous by Mary Portas. The town scrubbed up for the occasion and put on a show. Mary, was very much taken by the food Liskeard had to offer and for a while we were known as Lipsmacking Liskeard. Liskeard-Lights-Up is another annual event. It usually takes place on the 1st of December and starts with an impressive lantern parade. The Chrismas lights get turned on after a load count down from the crowd and then we get fireworks. Such fun. It seems to get better and better each year. Liskeard may be a market town, but it was once a stannary town too, where the local tin was stamped and taxed. It was so important in the eighteenth and nineteenth centuries, during a copper mining boom, that it returned two MPs. The nearby moors have a mining heritage that goes back thousands of years and Liskeard is now part of the World Heritage Site for Mining. Here in Liskeard, we have two historical figures to be proud of: firstly Michael Loam who invented the Man Engine. This contraption revolutionised the mining industry by transporting men (and boys) up and down the mine shaft. Formally they had to go up and down very long ladders which could take as much as an hour to ascend. His son became Mayor of Liskeard and erected The Fountain on the Parade to honour his father. Last year the Man Engine came to Liskeard and what a brilliant spectacle it was. Emily Hobhouse, a sadly forgotten Cornish hero, was born in my parish back in 1860. She was a human rights campaigner who caused rather a stir here in Liskeard by highlighting the appalling conditions of the British concentration camps in South Africa during the second Boer War. She went out to alleviate the suffering of the women and children in particular. She found that an average of fifty children per day were dying due to hunger, disease and cramped conditions. The viaduct, built in 1881 and the remains of Brunel’s earlier viaduct, make a grand statement on one side of the town. Other points of interest include the Pipe Well which is a sacred spring and probably the reason Liskeard was built in the first place. It’s never been known to run dry and is meant to bring luck in matrimony. It was also believed to possess miraculous healing powers and could cure “weak eyes”. Sadly the water is now not safe for human consumption. There’s much I haven’t mentioned, so for more information and ideas of what Liskeard and its environs hold, take a look at Visit Liskeard. The top photo was taken by Jason Higgs for the Ploughman’s Festival 2017 – © Jason Higgs/Ploughman’s Festival. What a lovely write up about our home town. Thank you and best wishes for you new adventure! From me at Bambino Cafe Liskeard ( The very new Play Cafe aimed at families and young children). Thanks Anna. Liskeard has a lot to offer. Good luck with Bambino Cafe, it sounds like a great idea. Liskeard is on my list to visit the next time we visit Cornwall, we missed it last year. I will kee in mind the places shared here, esp. the vegetarian eatery. And wow, must be exciting times for you and CT to be moving home soon, hope it goes smoothly as times like this are both exciting and stressful. Look forward to reading more in the near future. Thanks Shaheen. Sorry not to have caught up with you last year. It will be ironic if you do visit Liskeard next year when I won’t be here! Moving is indeed stressful and I have much to do, but as you say it’s also exciting. Thanks Jenny. It would be lovely to meet you at last and I guess Poole isn’t so very far away. Thanks Lucy. It took a while to make the decision, but once made it’s just a case with getting on with it. Good luck with the move. The place where you are moving to seems really interesting. A new beginning for you and new adventures! Thanks Alida, it definitely feels like a new chapter and I’m looking forward to getting to know another area properly and to new adventures. Thanks Nico. It’s actually going to be a bit of a slow move. I’m going up early because of the new job, so it’s more about what do I need for the first few weeks and making sure I haven’t forgotten anything essential! Thanks Sisley. Liskeard tends to get ignored as people shoot straight past it on the bypass, but those that do stop by seem to be glad they did. Loving your photos, looks like an amazing place to visit! Thanks for the share! Liskeard is definitely worth a visit. There’s far more to it than the few things I’ve highlighted. I hope all goes smoothly with your move! Always worth making changes every now and then. So funny that you’ve lived so many places beginning with L! Thanks Becca. Where next is the issue. I surely must be running out of Ls. Hope your house move goes smoothly, Choclette! Our last house move was so stressful, I’m determined never to move again. 🙂 Liskeard sounds like a wonderful town. I have never visited it, alas. I love Cornish yard, our local Waitrose sells Yarg in garlic leaves and in nettle, I wonder if it’s from the same producer. Thanks Galina. Moving is certainly no fun, but I’m trying to look to the longer term. Yes both types of Yarg are from Lynher Dairies. It used to be just up the road from where I grew up and much of the local employment was picking nettles. It got to big for the farm though and I think was bought out. It’s now somewhere near Truro. Good luck with your move – I am sure it will be with mixed emotions of sadness and excitment. You seem to have been part of the fabric of the town so I am sure you will be missed as much as you miss it. I hope you have fun getting to know a new place once the dust has settled. Thanks Johanna. It is very much as you’ve described. Cornwall will forever be my home, but I just won’t be living there. I am looking forward to a new start and new place though. Aw thanks Dom. I did reply to this when you wrote it, so not sure what happened. I completely understand the epic busy bit – it’s been totally mad for me these past few months and continues to be so. Moving is both heart breaking and exciting but I am looking forward to new adventures.